We invite you to explore India - the Land with infinite beauty ! Whether you soar high into Himalayas or peer under the ruins of the Ancient monuments dotting the landscape of India, you will cherish the experience long after your visit ! This India Travel Guide on Gwalior is free from any commercial interest! This site is dedicated to promote India - the vast subcontinent, its glorious past, magnificent landscape and its infinite variety. Gwalior, a historical city in Madhya Pradesh is one of the oldest cities in Central India. Known for its rich culture and heritage, glorious monuments, temples and palaces dot this historical city. The rock temples, fabulous statues and sandstone mosque portray the glorious tradition of the past. 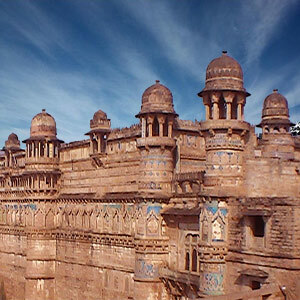 Founded by King Surajsan, Gwalior is named after saint Gwalipa who cured the king of leprosy. The magnificent fort here still has the tank from whose waters the saint is said to have cured the king. Being the birth place of Tansen, it is little wonder that the musical heritage of Gwalior is renowned. Located at the top of a sandstone hill, the Gwalior fort looms large over the city. It was considered an impregnable fortress in central India. The Mughal Emperor Babur described it as the pearl amongst fortresses of Hind. The Gwalior fort was one of the most unconquerable fortresses of north and central India. It was the administrative headquarters of the Tomars. It was home to the Rani of Jhansi and Tantya Tope. The Gwalior fort was the nucleus of the Tomar dynasty but fell into the hands of Ibrahim Lodi. Then, the Marathas captured it in 1754. The main entrance at the north comprises seven gates, Alamgiri, Bhairon, Hindola, Ganesh, Hathiapur, Lakshman and Hawa. Of the seven gates only five remain today. As you go uphill on the crisscross pathways, you can find the Jain Theerthankaras carved into the rocks. Representative of medieval architecture, the Gwalior fort bears a huge image of Garuda. Vikramaditya Palace: Vikramaditya Palace is located between the Man and Karan Palace. This place was built in 1516 and is connected to the two palaces by narrow galleries. Jai Vilas Palace: It is located in the new city and is the palace of the present Maharaja of Gwalior. It was built in 1909. It houses the Scindia Museum, is the historic seat of the Scindias. It was built by Maharajah Jayajirao in the Italian style. Don’t miss one of the largest carpets of Asia housed here. Teli-ka Mandir and Sas Bahu Mandir: The unique Teli-ka Mandir is about 30 m high and is a Vishnu Temple. This temple dates back to the 9th century AD and blends a number of regional styles. The shape of the roof is in Dravidian style and the temple has numerous Indo-Aryan sculptures. The Sas Bahu Mandir is also dedicated to Vishnu. This temple belongs to the 11th century. Man Mandir Palace: The Man Mandir Palace was built by Raja Man Singh between 1486 and 1517. The exterior of the palace is built of red sandstone and decorated with blue tiles, elephants, yellow ducks and peacocks. Tomb of Tansen: Father of Indian classical music, Tansen was one of the nine gems in Emperor Akbar's court. He is buried in Gwalior, the memorial of this great singer being a simple structure surrounded by gardens. This monument is a part of Gwalior's cultural heritage. A music festival is organized at this place each year in November - December and attracts singers and musicians from all over India. Sun temple: A recently constructed temple this temple is constructed in line with the Konark sun temple. Ghaus Mohammed Mausoleum: Ghaus Mohammed has a sandstone mausoleum and it lies in the old town of Hazira. The mausoleum is designed on early Mughal architectural lines. The screens look wonderful with unique pierced stone technique. The carvings on these screens are as delicate as lace. Gwalior is well connected by rail, air and road. Being a historical city and a place of tourist interest, accommodation is aplenty. Gwalior has extreme climate. The summers are very hot and winters are cold. Best time to visit is from October to March.